Sean Davis is ready to put a frustrating 2018 behind him and finish the year with a bang. The 28 year-old hasn‘t fought this calendar year after a number of fights, including a European Title shot, fell through. The Birmingham super bantamweight lost to Thomas Patrick Ward last November for the British title but was expected to challenge for European Honours in July. That fight was postponed and then cancelled last month, leaving Davis inactive for 12 months. As a result ‘Showtime’ has been drafted in for action at the Holiday inn Birmingham next Sunday, 9th December where he will blow off the cobwebs against Worcester’s ‘Man Mad’ Michael Mooney. “I’m just pleased to be getting back in there,” he told bcb-promotions.com. “It’s been a frustrating year. “I wanted to bounce back from the Ward loss and thought I’d be able to do that on the European stage but that fell through and months and months of preparation. “I’ve been in the gym most of the year so I’m fit as a fiddle. I just need some round so I spoke to Errol Johnson (BCB’s Head of Boxing) and he said he’d get me out before the end of the year. He’s been true to his word and I’m looking forward to it. Birmingham’s Ijaz Ahmed and Derby’s Conar Blackshaw go head-to-head for the Midlands Area Flyweight Title at the top of the bill at the Holiday Inn Birmingham, Smallbrook Queensway. 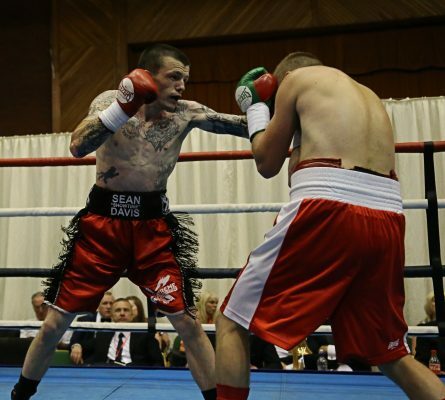 Davis is joined by Telford debutant, Liam Davies, and Poland’s Damian Kiwior on the undercard. Tickets for ‘Lord of the Flys’ are on sale, at £65 VIP ringside to include a two-course Sunday lunch or £35 standard. For more information and to buy, contact the boxers on Facebook.